Who doesn't love the feeling of completing a project you've been obsessing about for *years* and getting to wear it to the big event of the year? I know it seems silly - Lauren, gosh, just make x-y-z already - but as our lives get busier and time shorter, it's hard to stick to any project at all, let alone one with so many facets. I'm feeling proud of my completed 1790 Ottoman-inspired stage costume. It is some of the best (and fastest) work I've done, but more interesting to me are the levels of history and culture this ensemble deals with. At the Costume College gala - don't worry, I'll show you all the parts and pieces of this costume later (in better photos). Yes, I'm teasing you. 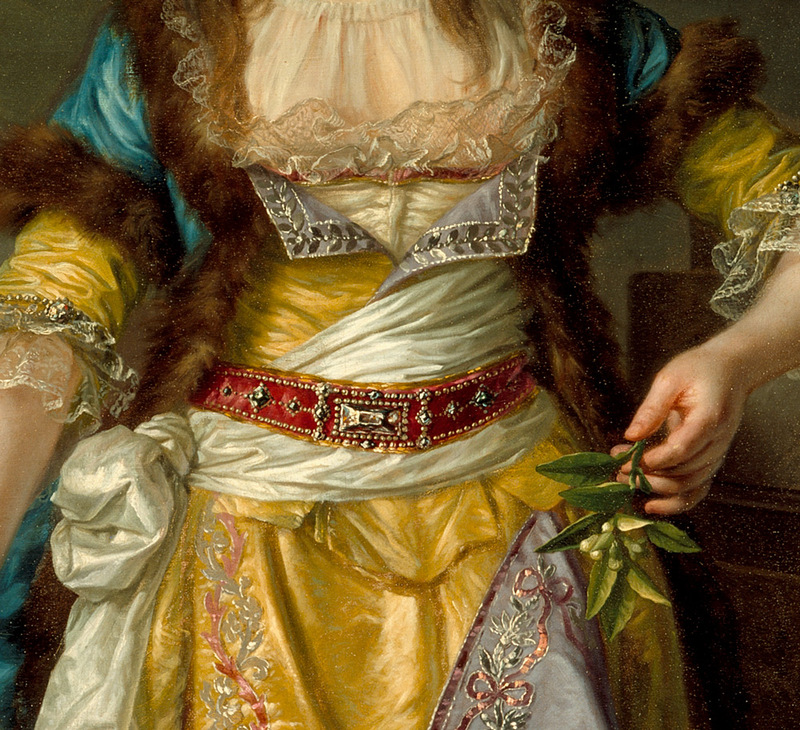 Originally I thought the portrait of Mademoiselle Guimard by Greuze, 1790, just depicted a woman in the popular Turkish-inspired dress so loved in France in the 18th century. As I peered into the world surrounding the creation of the portrait, though, I realized that Guimard's ensemble differed from the fashionable "Robe a la Turque" quite a bit. This helped me make decisions in how to construct the parts of this stage costume. 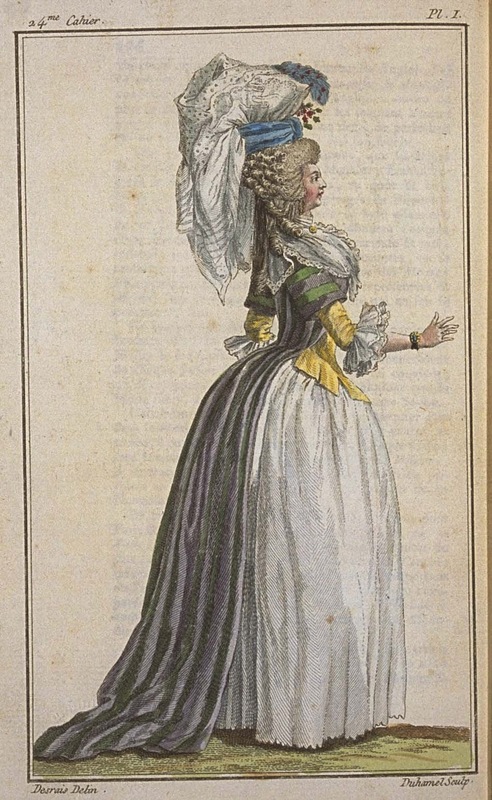 "Costume of the Sultana used in the Comedie Francaise in the plays where there is a role for this costume" (1779). Because I could not see the bottom half of Guimard in the portrait, I used this plate as secondary reference. I will go over each of these pieces and their construction in the next few posts about this project. 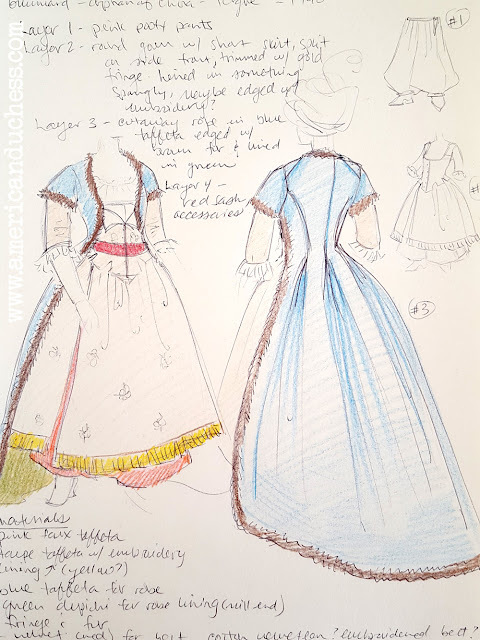 Ultimately, what I ended up creating from Greuze's portrait was what I believe to have been a stage costume thrown together from a variety of pieces made in the Western fashion rather than original Turkish pieces. The whole look together formed this European fantasy of Ottoman dress while having very little do with it, especially in the construction. My original drawing and notes from way back. For the most part I stuck to this. As a stage costume, the bright primary colors, extravagant textures, and shimmering trims would have read wonderfully and been a feast for the eyes. Oddly enough, viewing the Chagall exhibit at LACMA two days before wearing this costume really helped me understand the needs and intentions of theatrical costume, quite different from those of fashionable dress, even if both have the same Turkish influences. In the end, I felt glamorous and authentic in this costume, but authentic only to the portrait of Guimard. To fashionable dress of France in 1790s or to real Ottoman dress of that period there was no faithfulness then nor now. And this fascinates me. 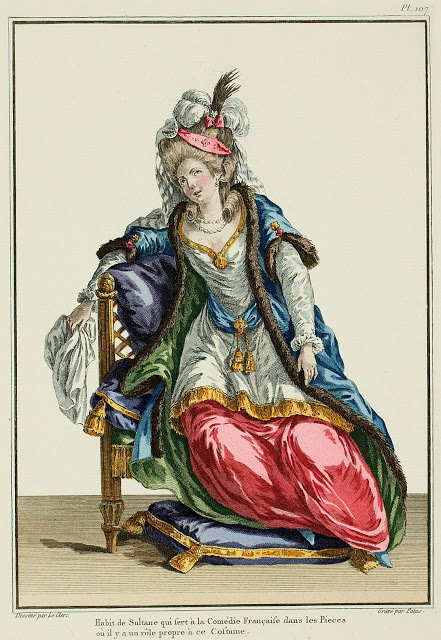 An example of the fashionable Robe a la Turque. Cabinet des Modes - November 1786. This is pretty similar, but it will have been constructed differently with the yellow bodice and striped robe likely being stitched together. Parts of this costume were quite easy while another part was the hardest technical challenge I've ever attempted. Stay tuned for more posts on each of these pieces and how they were made in the Eastern fashion using Western methods. 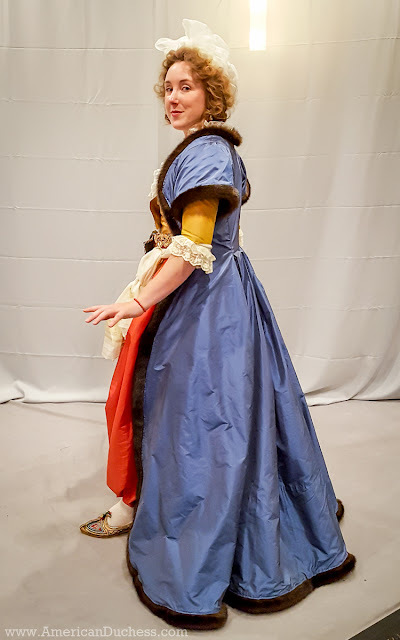 This is such a great outfit - and I hear you so much on finding two days to string together to hold a costume project in mind when everyone wants your attention! I look forward to more! I neither sew nor costume, but I love your blog, Lauren! You write so well and look adorable in every outfit--it's a joy to come to your website! Speaking of Chagall - I've seen several productions of "Fiddler on the Roof" in which the costumer and set designer took much inspiration from Chagall - the colors and stylized people and animals - and I agree that he is so perfectly suited to the theater!! Indeed! The costumes were amazing. Some of them were quite scary too. I have never seen a ballet with costumes like these, but I can only imagine what they must have looked like moving. I was so thrilled to see that you'd completed this project - looking forward to reading all the posts! What I've seen so far is fabulous. Love it! I'm so happy you finally finished this outfit! It was wonderful to see it in person and I look forward to the reveal on how you achieved it.